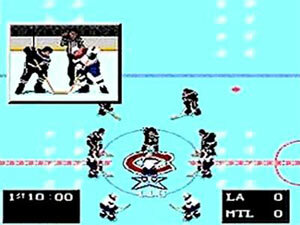 Who could forget NHL93 for Sega Genesis??? I’m sure I don’t need to tell you how awesome NHL Hockey 93 is, was, and will continue to be but why the hell wouldn’t I? To avoid any claims or allegations of plagiarism all quotations will be cited from my source, the NHL Hockey 93 owners manual by EA Sports. New Features to this epic game include “Tougher, faster goalies NOW dive for pucks, lunge for high corner slapshots and make heart-stopping kick saves!” (NHL Hockey 93 owners manual 3). This is especially true for Patrick Roy and Eddie Belfour, game in and game out these guys go hunting for goose eggs. “Expansion teams Tampa Bay and Ottawa included in Hockey ’93” are about as lousy as you get, lousy as in a dumpy wave train coming in at sunset. (NHL Hockey 93 owners manual 4). Ottawa and Tampa Bay’s speed and agility is like watching a race between Charlie Weis and Romeo Crennel… Simply not gonna fill the seats. Of course I have to mention the “New player animations including super slap shots, great skate skills, flipping body checks and blood on the ice!” (NHL Hockey 93 owners manual 4). While players such as Jeremy Roenick, Mario Lemieux, and Mark Messier are offensive juggernauts, Chris Chelios and Cam “Sea Bass” Neely blister shots from the blue line and rarely shy away when the gloves are dropped. As a 24 year old child I’m getting the same enjoyment of pounding all competitors with Super Mario and the Stanley Cup Champion Pittsburgh Penguins as I did as a 9 year old on that snowy christmas morning in 93. You are currently browsing the archives for the Mario Lemieux category.